Thor has been around for a long, long time. I’m not just talking about the lore. In comics, he technically made his first appearance in Venus #12 back in 1952. Lots of die hard fans recognize Journey Into Mystery #83 in 1962 because it is the closer to the current version of the character. Both books were penned by Stan Lee so I guess only he knows for sure. However he came to be – Thor has been making the trip between Asgard and Midgard for a long long time. Over the time Thor has been around – he’s done everything you can imagine. He’s fought aliens, battled other gods, been a member of the Avengers for years. He’s gone toe-to-toe with Thanos and been a woman (well – not technically but the book has been about Jane as the hammer wielder). He lost his hammer. He lost his arm. Poor, poor Thor. The story is exactly what you would expect: a vehicle to explain how Thor is trying to get his hammer “Mjolnir” back. The process of getting said hammer back is a side trip in getting back all the items that were misplaced from Asgard. As a result, the re-aquisiton of the hammer felt a little too easy. There is more time spent fighting the unbeatable foe “The Unstoppable Juggernaut” who is beaten very quickly by hammers falling out of the sky. I’m not saying that the story is bad by any means – Jason Aaron writes a very well formed story and dialog. The problem with this is it just feels like they are trying to get him back on the hammer as quickly as possible. Then the story calms right now with character development stories with Jane Foster, Odin and Loki. The better story is the “Grace of Thor” second part. This continues the old man Thor concept that was started in recent Thor books. Thor has to face the concept that Jane Foster is dying. It’s well written and you empathize with all the characters involved. Del Mundo’s art is another case entirely. It’s really pretty. But it doesn’t seem right for this book. It was a great choice for their other book Weirdworld. It’s a pencil crayon feel with a slightly ethereal style and very little complexity or atmosphere/background. The first part of this book uses a bizarre color palette that includes a lot of light green and pink. Juggernaut is slightly pink. The style feels a little more comfortable as Thor moves to other locations like The Bronx or Asgard. Again, the second story is much better from an art standpoint. Christian Ward uses more of a style that could be compared to a Riley Rossmo. It’s more of a standard color palette that uses a more solid line style that is so much easier to follow. We’re not talk about an Amazing Spider-man style by any means. It’s still a very artistic take while making it easier for the reader to enjoy both the story and the art equally – creating a more cohesive experience. This is a Thor book – there’s no confusion there. 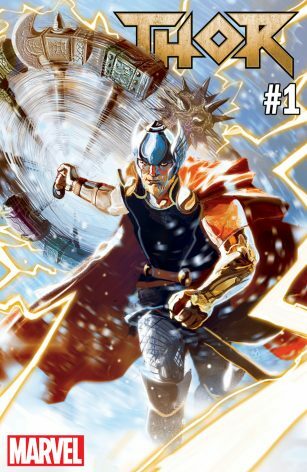 Consequently, if you’ve been with Thor for the past few years, this book is a continuation of what has been done right. It also restores Thor back to his pre-Jane Foster state without writing her completely out of the story.